Tamilnad Mercantile Bank has announced openings for the post of Statistician (Senior Manager), Database Administration (Assistant Manager), Credit Officers and Economist (Senior Manager). 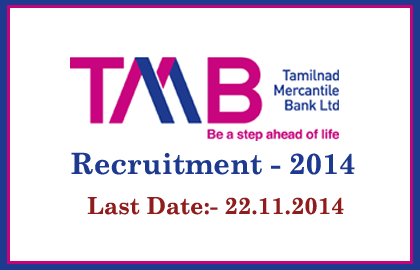 Eligible candidates can apply for this post on or before 22.11.2014. More details regarding this recruitment were mentioned below. Any Graduate or PG (Other than Engg. discipline) with First Class in recognized university. PG in Economics/Mathematical Economics (other than Engg. Discipline) with min 55% marks in recognized university. How to Apply: Eligible candidates can apply by filled the application form which you can download from the link that was given below. Fill the complete required details and attach the self attested relevant documents. That Form should be subscribed as “The Application of the Post of- Statistician (Senior Manager)/ Database Administration (Assistant Manager)/ Credit Officers or Economist (Senior Manager)”. Send that application form to the below mentioned address. Your Application should reach on or below 22.11.2014.